This cool, rich, melt-in-your-mouth mousse contains only two ingredients: chocolate and cream. I first made this at culinary school as a filling for a decadent Marquise cake — I’ve been making it ever since, with or without the cake. I’ve added pear chips and chocolate leaves for textural contrast and height. A thin cookie perched atop the mousse would do the trick, too. When it comes dessert, it’s okay — no, it’s imperative — to show-off. This mousse is rich. I serve it in the smallest containers possible. Shot glasses and sherry glasses are ideal. Recipe adapted from a white chocolate mousse recipe in Le Cordon Bleu Dessert Techniques. Originally published in EAT Magazine Nov/Dec 2010 issue. * I use Bernard Callebaut semi-sweet chocolate — 66% cocoa. If you want the mousse to rise above the containers, as pictured, first make a collar by wrapping a piece of parchment or waxed paper around each container, leaving about 1” excess above the container. Secure the paper with tape or kitchen twine. Prepare your containers prior to making the mousse. The key to this mousse is the temperature of the chocolate. It should be completely melted but not too hot. The ideal temperature is 50 degrees Celsius, which is warm, not hot, to the touch. If you have a kitchen thermometer handy, use it. In a metal bowl that fits over the saucepan of barely simmering water, ensuring that the bowl does not touch the hot water, add the chopped chocolate and 1 cup of whipping cream. Gently melt the chocolate, stirring occasionally, until the chocolate is fully melted, but not overly hot. In the bowl of a stand-up mixer fitted with a wire whisk, add the remaining 3 cups of whipping cream. Whisk the cream until it is thickened only. The cream should not be firm enough to hold its shape. When you remove the whisk from the bowl, the cream should drip off in thick beads. With a whisk close at hand, pour the warm melted chocolate, all at once into the barely whipped cream. 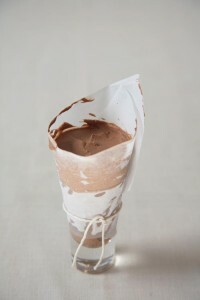 Combine with a whisk until the chocolate mousse is uniform in colour. The texture will firm as you combine the chocolate with the cream. The mixture is now ready to pour into your containers. If you have a piping bag, pour the mixture into a piping bag; this will help get the mousse into the glasses neatly, without any mess. Managing a piping bag is easy when you use a narrow canister or large-mouthed glass to hold the piping bag in place while you fill it. 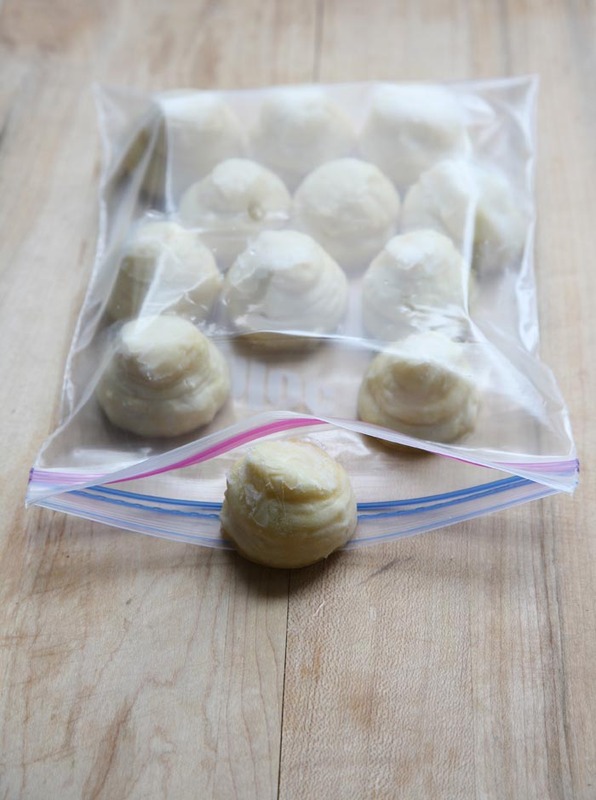 Simply tuck the narrow end of the bag into the container (tip side down) and roll the large end of the bag over the edge of the container, like a cuff, to hold it in place. Pipe or spoon the mixture into the glasses and refrigerate until set. Combine the sugar, water and lemon zest in a small saucepan and heat the mixture until the sugar is completely dissolved. 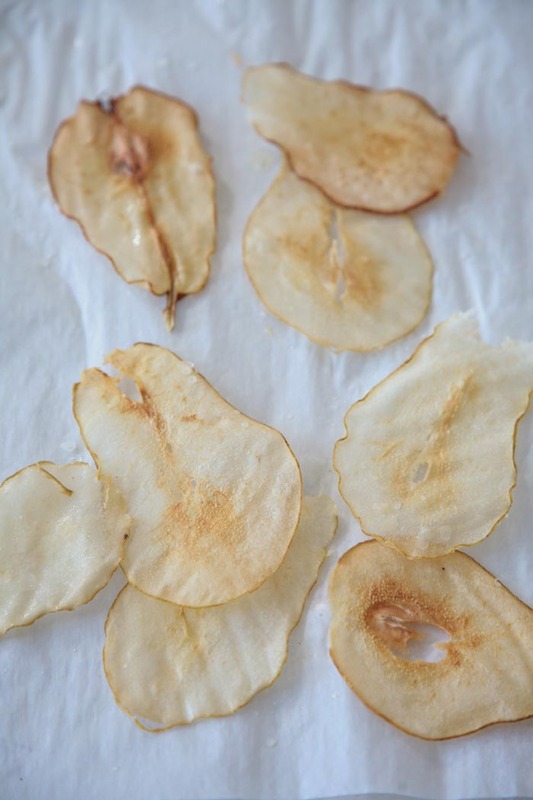 Slice the pear into paper-thin slices using a mandoline or single-blade slicer/grater. Using a pastry brush, coat both sides of each pear slice with the sugar-water solution. Place the coated slices on the parchment-lined tray, being careful not to overlap the slices. Dry in the oven for 2 to 3 hours. To test the chips, remove the tray from the oven and allow the pears to cool for 10 minutes (away from a humid kitchen). If your kitchen is warm, place the tray of pears outside to cool them. Gently peel the pears from the parchment. If they are firm and crisp, they are ready. 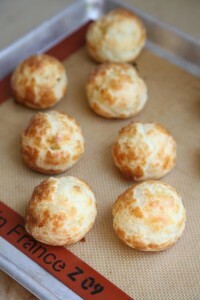 If not, continue to dry them in the oven for another half hour and test again. The pear chips can be made a few days ahead of time and kept in a covered container. Melt the chocolate in a metal bowl placed over a saucepan filled with one inch of simmering water. The bowl should not touch the water. When the chocolate has just melted, dip the cleaned leaves into the chocolate and place on a parchment-lined tray. Try to coat only one side of each leaf with chocolate as this will make it easier to remove. Place the leaves in the refrigerator to firm the chocolate. Once the chocolate has firmed, carefully peel back the leaf from the chocolate. To serve the mousse, remove from the refrigerator approximately 20 minutes before serving. 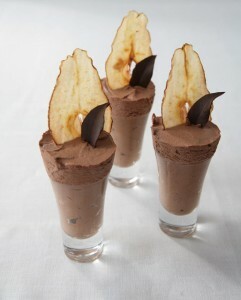 Remove the parchment collar and garnish with the pear chip and chocolate leaf just before serving. 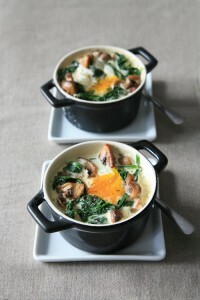 I enjoyed many versions of Egg en Cocotte, or Oeufs En Cocotte, during a summer in France. It was often served for lunch or as an appetizer. I enjoy it anytime — it’s easy to prepare, cooks quickly and transforms leftovers into French bistro fare. Beret, wine and accordion optional. I’ve used a filling of spinach and mushrooms but there are plenty more suggestions below. Consider this but a template for making your own version of Eggs en Cocotte. No matter what filling you use — it must be well-seasoned. Taste the filling and adjust with additional salt, if necessary, before adding it to the egg. You will need about 3/4 – 1 cup of filling to fill six ramekins. Here are a but a few suggestions — a peek into your refrigerator will come up with many more. Brush each ramekin with the melted butter. Place a generous spoonful of one or two of the suggested fillings into each ramekin. Top with a bit of grated Parmesan cheese, if desired. Make a slight indentation in the filling with the back of a spoon to make room for the egg. Break an egg on top of each mixture and season with salt and pepper. Drizzle the egg with a bit of cream. Place the ramekins in the saucepan (or baking dish) and pour the boiling water into the pan, being careful not to pour water into the ramekins. The water should come halfway up the sides of the ramekins. Cover the pan with a lid or foil and carefully transfer the pan to the oven. Bake just long enough to set the egg white, about 12 minutes (the yolk should be runny or very soft). If the egg white is not quite firm, remove the lid and place under the broiler for about two minutes. Remove the ramekins from the pan and drain off any excess butter, if you wish. Serve immediately with hot buttered toast. This mellow, silky smooth roasted squash soup has just enough fruit to give it a sweet lift. 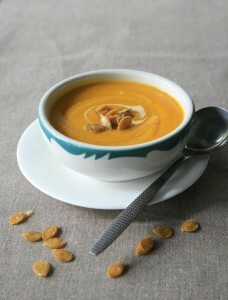 It is drizzled with a tangy sauce made of the mildest blue cheese and topped with toasted squash seeds. The sauce is a quick, flavourful tip I learned from my talented friend, chef Castro Boateng. If you’re lucky enough to live on Vancouver Island, chef Castro offers courses from the convenience of your home. What could be more fun? In a medium bowl, toss the carrots in 1 tablespoon of the vegetable oil and place them on a foil-lined baking tray. Brush the squash with the remaining oil and place on the same tray. Roast the vegetables for about an hour, turning occasionally. Remove the vegetables when they can easily be pierced with a fork. When the squash has cooled, scoop out the pulp and discard the skin. Melt the butter in a soup pan over medium heat and add the diced apple. Cook the apple until it turns soft and just starts to colour. Add the chopped onion and cook until the onion is translucent. To a blender or a food processor fitted with a steel blade, add the roasted carrots and squash, sautéed apples and onions, diced pear, 2 cups of the chicken stock and a couple generous pinches of Kosher salt. Process until smooth, adding enough remaining stock to achieve the desired consistency. Taste the soup and check the seasoning, adding more salt if necessary. If you prefer a fine-textured soup, pour the puréed soup through a fine-mesh strainer. Transfer the soup to a saucepan and reheat. Serve in heated bowls with a generous swirl of blue cheese cream (recipe follows) and a few toasted squash seeds, if desired. In a small saucepan, combine the cream with crumbled blue cheese. Gently cook on low heat until the blue cheese melts. Be careful not to boil the mixture. Rinse the squash seeds to remove the fibres. Toast the cleaned seeds on a lightly oiled baking sheet in a 350°F until crisp and lightly golden, turning occasionally. Sprinkle with salt while still warm. Tossing a carton of ice cream in your shopping cart might be second nature, but making your own can spark your imagination with endless possibilities. 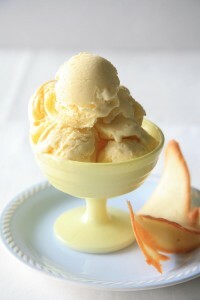 Ice cream, after all, is but a cool ivory canvas, waiting to be flavoured with your favourite ingredients. If you’re wondering if it’s worth the effort, you’ve probably never tasted homemade. Fortunately, today’s electric ice cream makers transform chilled liquid into a frozen dessert with a flick of a switch. The custard base is simple to make with a wide margin for tinkering. You can get away with using less yolks or more liquid than the recipe calls for and still have the best ice cream imaginable. No need to rush off to the store if you’re a little short on one ingredient or another. This formula, found in Michael Ruhlman’s Ratio, makes for an ultra-rich ice cream. For a lighter ice cream — if you can call a cream-based dessert light — reduce the yolks by two or three. I’ve added pure vanilla to flavour the base recipe. For variations on this recipe, see strawberry and coffee flavoured ice cream. Originally published in EAT Magazine‘s July/August 2012 issue. Place a fresh vanilla pod on a flat work surface and, with a paring knife, slit the pod in half lengthwise. Using the dull side of the paring knife, scrape the minute seeds from both halves of the pod. Set aside the vanilla seeds until the custard is ready. In a medium bowl, whisk the egg yolks with the sugar. Add about 3⁄4 cup of the warm milk and cream mixture to the egg yolks and whisk until well combined. Slowly pour the yolk mixture into the saucepan with the remaining milk and cream mixture and bring to a bare simmer, whisking continuously, being careful not to bring to a boil. The custard is ready when the mixture thickens and lightly coats the back of a spoon. Pour the mixture into a frozen canister and freeze according to manufacturer’s instructions.